Demo VB.NET application using OCX control csXImage. The download of either the free trial or registered version of csXImage includes a VB.NET project. 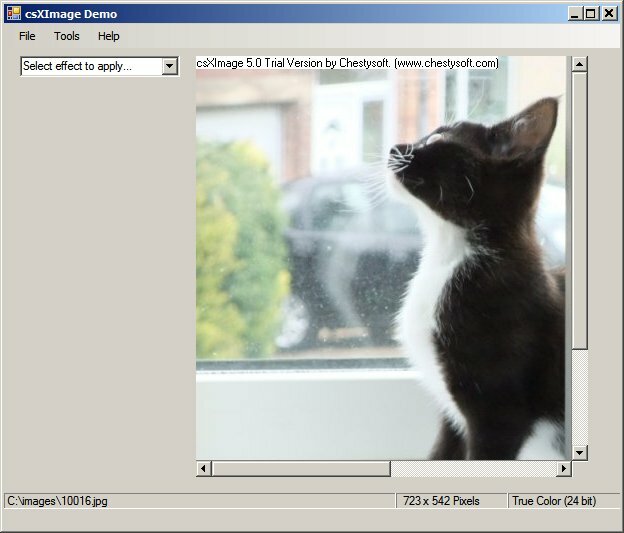 This is a simple image editing application, designed to show how the ActiveX control csXImage can be used to load, save and edit images. The following pages show some of the functions that are included in the demo project, with brief explanation about how these could be used in your own projects. First, let us look at the demo application in action. The VB project is based on a single form, fMain. After opening and running the project, the form is displayed with its menu bar. After selecting File/Open, an image file of one of the formats supported by csXImage can be selected and opened. The image is loaded into the control on the form and displayed. A value can now be entered, and the brightness of the image adjusted by clicking 'Apply'. The colours Red, Green and Blue can be individually selected to tint the image with a particular colour, or by leaving all three selected, the overall brightness is adjusted. Simple Effects - Examples of using the Brightness and Sharpen methods. Image Merging - Using the MergeFile method for stamping or watermarking images. Mouse Events - Reading pixel information as the mouse is moved over the image. Red Eye Reduction - Removing red-eye and selecting a region of the image.